20% of sales go to the ASPCA! No, seriously. I’m so glad I review self-published books or I would have missed this one. To think all these stories REALLY happened to Annie Greer. Oh My Gosh. She really IS a magnet for weird animal behaviour. I must warn this book has some mature language. However it’s not in an excessive, totally not needed sort of way. It’s also not so much swearing as adult language such as sexual terms, although there is some swearing. Normally I hate swearing but if I was in that situation, I think I would swear too! I cannot decide which story is my favourite, they were all great. I chuckled or laughed out loud a few times. I wanted to read passages to my husband but he hates when I do that so I restrained. I’m not sure what else to say other than buy and read this book. I hope it gets picked up by a bigger publisher and gets put on amazon so it’s more readily available. 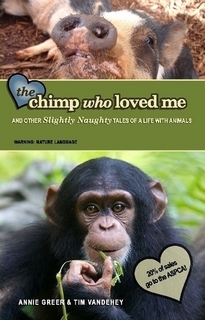 The Chimp Who Loved Me is not available on Amazon.com [UPDATE: It will be on amazon.com in January, I will provide a link when I get it.] but you can buy it through Lulu. Remember: 20% of sales go to the ASPCA.